Home fashion fashion essentials Stella & Dot New Stylist Sign-up Special from Stella & Dot! New Stylist Sign-up Special from Stella & Dot! Good news! Stella & Dot is currently running a new Stylist sign-up special. New stylists who join through April 30th will get a Taj tote & $350 in accessories for $199! Don't let this chance pass by and take advantage of this fun, flexible and rewarding opportunity to do what you love, work when you want and earn what you need today. 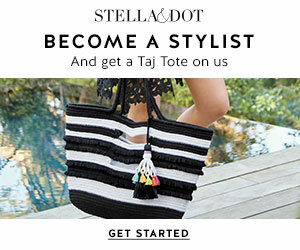 Become A Stylist: Limited Time Sign-Up Offer - Get a Taj Tote ($98 value) + $350 in accessories for $199.